[THOMAS JEFFERSON]. Newspaper. 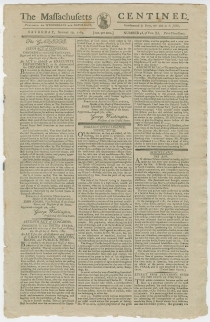 The Massachusetts Centinel. Jefferson’s Notes on the State of Virginia. 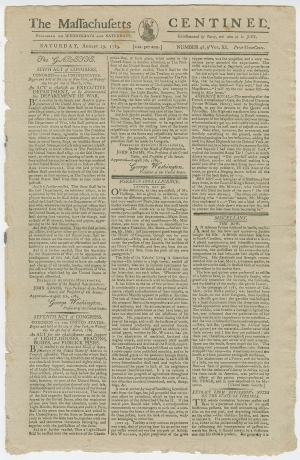 August 29, 1789. Boston: Benjamin Russell. 4 pp. “An Act to Establish an Executive Department, to be denominated the Department of War,” & “An Act for the Establishment and support of Light-Houses…and Publick Piers,” both signed in fancy script type by Washington. The story of a captured African Prince’s bow and quiver making their way to America with him, and ultimately being used by his master’s wife to defend her home from the British, is related with news of the bow being presented to Charles Willson Peale’s Museum.